The United States Centre for Disease Control and Prevention (CDC) has categorically denied it is planning to carry out an Ebola Virus Disease (EVD) screening for Nigerian passengers flying into the United States. 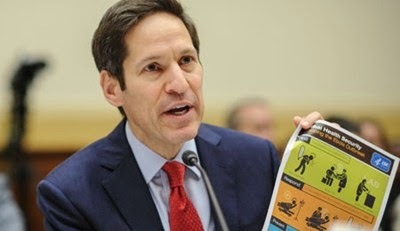 According to Tom Frieden, CDC director, any such proposition would be counterproductive in particular after the US has extolled Nigeria for its heroic battle against the spread of the virus. Nigeria's Ambassador to the US, Professor Ade Adefuye who spoke with THISDAY after his contact with Frieden said the CDC was glad to collaborate with Nigeria after it had been certified Ebola free with commendation from the highest authority, in apparent reference to the executive branch of the government, and a front page report by the New York Times last Wednesday. Frieden, according to Adefuye, said the US was so impressed with Nigeria’s ability to nip in the bud the spread of the disease that it proposed inviting Minister of Health Professor Onyebuchi Chukwu to the country for collaborative efforts by way of assistance with other countries using the AU as a platform. However that plan was shelved when Chukwu announced Nigeria has donated $3 million to help fight the Ebola virus in the affected countries as well as collaborate with the Economic Community of West African States (ECOWAS) in combating the virus. Only last Tuesday after publicly stating it has discovered a case of EVD in Dallas, Texas, which it said was under control asking the public not to panic, the CDC said it was sending its personnel to study how Nigeria contained the killer disease. According to Frieden in that report, the nation needed a quick and thorough response to its first Ebola patient. Frieden said “The best practices in Nigeria and Senegal suggest the U.S. should monitor all individuals who may have been exposed to Ebola and establish a dedicated management and response system. The Associated Press report carried by THISDAY has jolted Nigerians in the US who gathered on Independence Day to celebrate the success of the country in fighting Ebola as well as recording a rising profile in the comity of nations at a time the Boko Haram insurgency has brought national morale to a low. Frieden added that that such a restriction would likely be ineffective and would make it harder for health officials to root out the virus. Adding to the debate in his interview with Politico Republican Senator Ted Cruz said: “Even if we tried to close the border, it wouldn’t work. n Texas, health officials screened up to 100 people in connection with Liberian national Thomas Eric Duncan, who is in isolation at Texas Health Presbyterian Hospital. Duncan flew to the U.S. on Sept. 19, but the CDC said that he was screened before his flight in Monrovia and showed no symptoms of Ebola. Health officials say his temperature was 97.3 degrees and that he was not contagious on the flight, meaning his fellow passengers were not at risk. While in Liberia, Duncan had contact with a woman who had the virus and helped carry her from a taxi, according to The New York Times. In several interviews and at a Thursday news briefing, the CDC director has expressed confidence that health officials will be able to contain the spread of the virus in the U.S.
On Thursday evening, NBC said a freelance journalist working for the network in Liberia had contracted Ebola and quarantined himself on Wednesday. Earlier on Independence day, Nigerians had expressed joy that nipping the virus in the bud was evidence of a nation on the rise. His wife Mercy a registered nurse just like Dr. Theo Ogune a Nigerian-American lawyer practicing in both countries, noted that Nigeria may not be where it is supposed to be “but we are making progress. Our containment of Ebola has raised the perception on a positive note. The perception of Nigeria globally is rising,” with Ejikeme confident that Nigeria having come a long way can do better;” however the report brought mixed to them just like most residents in New York, Maryland and Washington most of whom had gathered for the October 1st celebration. The commendation keeps rising with CNN Anderson Cooper and his guest on his 360 Degrees programme giving the Nigerian health authorities high marks for combating a virus that has brought more nightmares to the world than the HIV/AIDS syndrome. Also on Wednesday at an emergency meeting of the United Nations, Margaret Chan told participants to take a cue from the stable condition in Nigeria and Senegal.